Having missed out on seeing the film 'Most Likely to Succeed' when it was shown in Hamilton I did what any self-respecting librarian would do and got the book out of the public library. 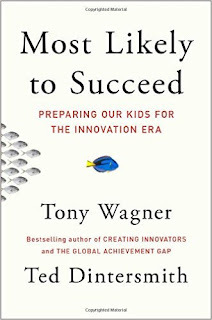 The book, by Tony Wagner and Ted Dintersmith, is a cautionary tale about losing sight of the bigger picture and not keeping up with a changing world. The authors tell us about how the education system we have today is largely unchanged from that set up in order to provide workers for the industrial era. Our access to smartphones, crammed with more computer power than NASA used to get to the moon in 1969, is disregarded, in most cases discouraged. We continue to teach students in the same way that we always have, with a focus on learning content that anyone can Google if needed and that most of us forget when we don't use it in real life. The authors claim that "since information is readily available to everyone, content knowledge is no longer valued in the workplace". Instead what we should be focussing on is "forming independent opinions, critically evaluating the logic of others, communicating, collaborating, solving problems creatively, and synthesizing". This emphasizes the importance of digital and information literacy skills, which are often taught by a librarians. It also provides a good case for a library having a Makerspace, where students can be encouraged to work together and meet challenges. The authors also assert that somewhere along the line the U.S. education system has managed to make the purpose of education to pass a bunch of largely unhelpful-in-real-life tests. What's worse is that because the tests are standardised and cost so much to administer, they are limited to what can easily be measured and not necessarily what is useful for students to learn. In relation to reading the authors say "...if you're designing tests, there's no way to standardize based on students reading mostly what interests them". So it is the test designers who are calling the shots, requiring that students read the same text even though it probably won't appeal to everyone. 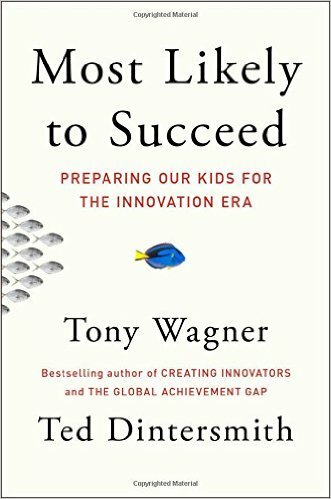 There is a real fixation on test results - "...the bulk of U.S. education is a largely hollow process of temporarily retaining the information required to get acceptable grades on tests". When this information is also irrelevant to the real world you can see why students get bored and lack motivation. And what is even worse is how early the focus on testing impacts children's lives. The book describes a kindergarten that cancelled its school play "to devote more time to preparing its six-year-old students for college and the workplace". How awful! One thing that particularly resonated with me was the authors' claim that the primary goal of education should be to help students find their true passion and purpose in life. They feel that schools should "expose students to a wide array of pursuits and help them find what they love spending time on". Having a library with a wide range of books, technology activities and a Makerspace, helps them do this, as does providing support for students who are involved with genius hour or passion projects. Last year the OECD published an interesting report stating that using technology at school doesn't improve test results. I thought of that report when I read this: "The impact of innovation in education isn't in using technology to deliver obsolete education experiences". How often is technology used to simply repeat the same lessons teachers have always taught? This goes back to the substitution level of the SAMR model. Technology needs to be used in education to allow new and innovative education experiences that fully engage students and allow them to direct more of their own learning. If technology can help students engage more with a lesson we are teaching on library or information literacy skills, then we need to be embracing it in this way as well. You can probably tell that I enjoyed reading 'Most Likely to Succeed' and it got me thinking about how a library can support positive changes to the education system.